Data is not and cannot be utilized in the UI, so what’s the purpose? Documenting what your CRM environment looks like and what changes you’ve done to it can be such a drag. Compared to how fast you can perform and publish customization changes in Microsoft CRM, writing it all down and communicating it to the rest of the organization can take a lot more time (the same goes for planning your customization changes before rushing into doing them). Most people will learn the purpose of documentation only the hard way, after running into process errors resulting from a misunderstanding of what data goes where, what scripts affect which fields etc. After fighting with one such case recently, where I had to perform checks on entity form contents of four supposedly similar CRM instances, I just got fed up with the number of browser windows cluttering my screen and decided to search for a smarter solution. I remembered running into a CRM documentation application some half a year ago, but since it required Excel 2007 which I didn’t yet have at that time, I never had the chance to try it out. Having now upgraded to Office 2007, I promptly surfed to CodePlex and looked up the Microsoft CRM Documentation Generator by Merjin van Mourik. What a beautiful tool this is! Not only does it produce a neat list of all your entity forms, their scripts and picklist field lists of values, it does this “live” on your screen. Just export the customizations.xml file, load it up in the Excel add-on, then lean back and enjoy as the CRM server magically documents itself, one attribute at a time, for each of your hundred entities. After the show is over, you can copy & paste the information you need and quickly compare CRM instances side by side to track down the differences. The Documentation Generator tool is made for Microsoft CRM 3.0, so all you hip people already on 4.0 may be better off with Microsoft CRM 4.0 Form Reporter, which allegedly does the same thing in Word 2007 format. 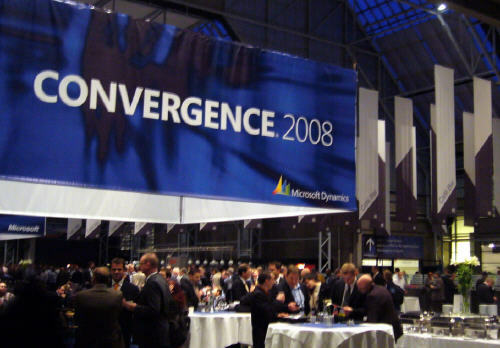 This was the first time I attended Microsoft’s Convergence, the conference for their Dynamics product family. The event turned out to be quite a positive experience. Sure, there was more than enough marketing hype for MS products, but it certainly wasn’t the only item on the agenda. Plenty of practical examples and real life success stories were included, allowing you to catch interesting details about the future direction of the CRM product and even honest comments about it’s current shortcomings. I was pleased to see a strong focus on application usability and user experience improvements in many of the presentations. Seems like Microsoft is serious about leveraging its decades worth of experience from producing software for the consumer market and using that understanding as a weapon against its competitors on the business applications playing field. Once I’ve managed to grab the presentations and review them, I though I’d share some of my Convergence 2008 session notes here in this blog. Most of the truly valuable information is usually not in the PowerPoint slides but rather in what is said during the presentation. It would be interesting to also read what the other session attendees wrote down, just a shame that the Dynamics Community site is so poor that I’ll probably need to hunt down this information in various CRM blogs around the net. Copenhagen was a nice city to visit, check out my Picasa Web Albums for some of the pictures I managed to take during the conference and the afterhours downtown. Would be fun to go back there on a warmer time of the year, so you could truly enjoy all the different flavors of Tuborg beer. Since next year’s Convergence will not be in Denmark anymore, I guess I’d need to pay for the trip myself then.